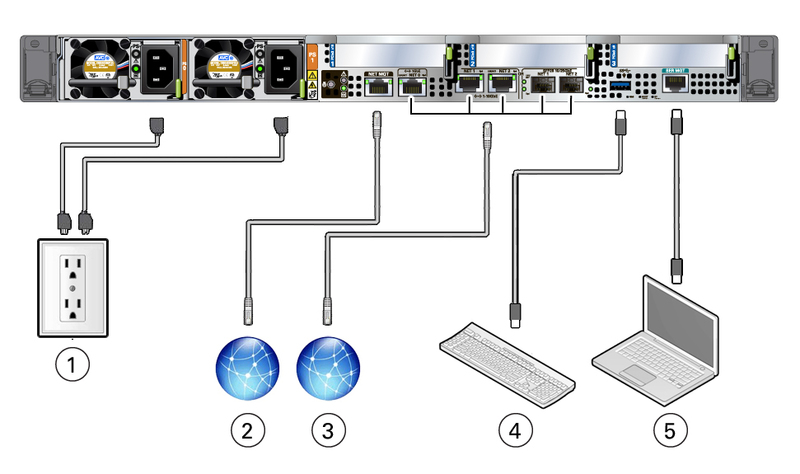 The following illustration shows and describes the locations of the back panel connectors. Use this information to set up the server, so that you can access diagnostic tools and manage the server during service. The server has two power supply connectors, one for each power supply. Do not attach power cables to the power supplies until you finish connecting the data cables to the server. The server goes into Standby power mode, and the Oracle ILOM service processor initializes when the AC power cables are connected to the power source. System messages might be lost after 60 seconds if the server is not connected to a terminal, PC, or workstation. Note - Oracle ILOM signals a fault on any installed power supply that is not connected to an AC power source, since it might indicate a loss of redundancy. The service processor NET MGT port is the optional connection to the Oracle ILOM service processor. The NET MGT port is configured by default to use Dynamic Host Configuration Protocol (DHCP). The service processor NET MGT port uses an RJ-45 cable for a 10/100/1000BASE-T connection. Note - SFP+ ports support up to 10GbE when using SFP+ transceivers, and up to 25GbE when using SFP28 transceivers. The five Gigabit Ethernet (GbE) ports enable you to connect the system to the network. Note - The 10/25GbE SFP+ ports are the default network ports for the server. When using an SFP+ port, network connectivity is disabled on the 10GBASE-T RJ-45 GbE ports. The USB port supports hot-plugging. You can connect and disconnect a USB cable or a peripheral device while the server is running without affecting system operations. The service processor SER MGT port uses an RJ-45 cable and terminal (or emulator) to provide access to the Oracle ILOM command-line interface (CLI). Using Oracle ILOM, you can configure it to connect to the system console. Note - This port does not support network connections.